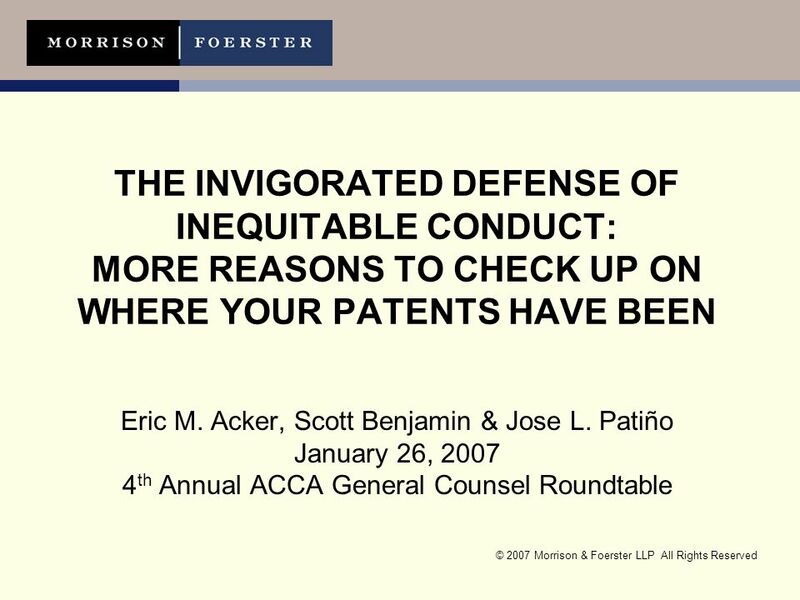 © 2007 Morrison & Foerster LLP All Rights Reserved THE INVIGORATED DEFENSE OF INEQUITABLE CONDUCT: MORE REASONS TO CHECK UP ON WHERE YOUR PATENTS HAVE. 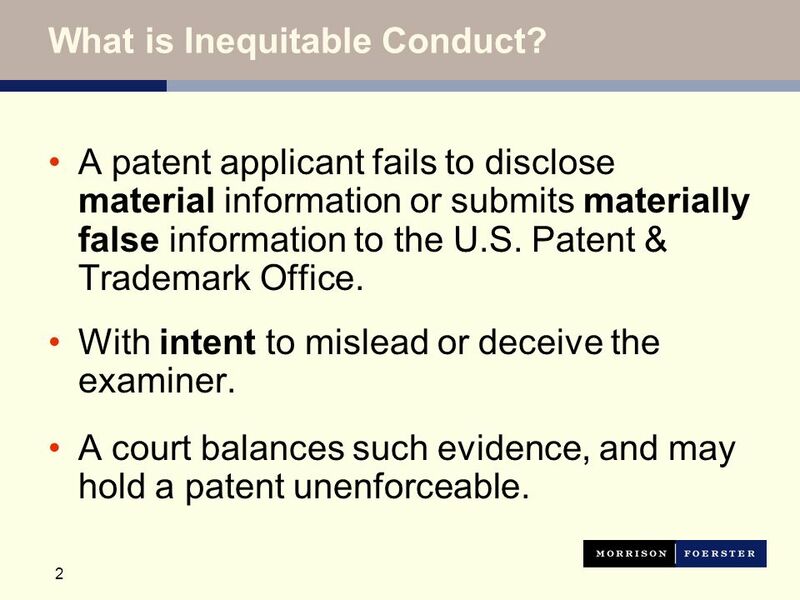 2 2 What is Inequitable Conduct? 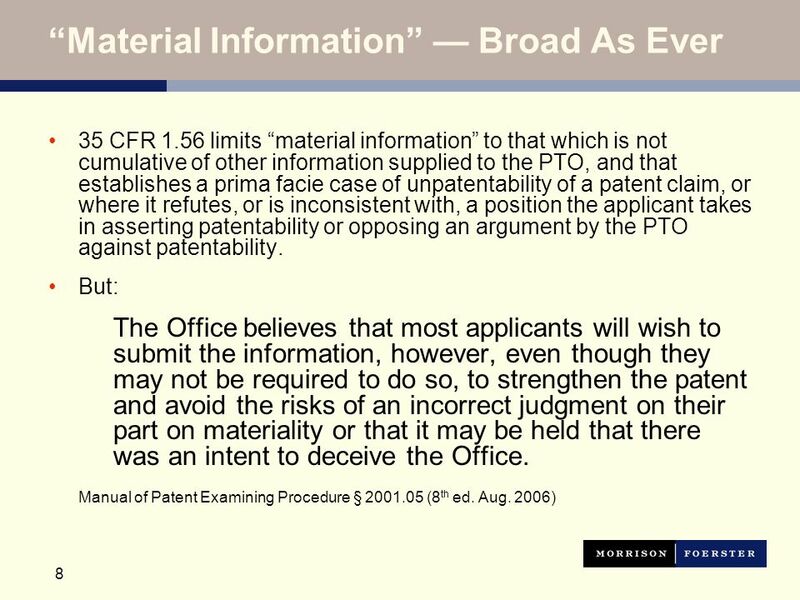 A patent applicant fails to disclose material information or submits materially false information to the U.S. Patent & Trademark Office. With intent to mislead or deceive the examiner. A court balances such evidence, and may hold a patent unenforceable. 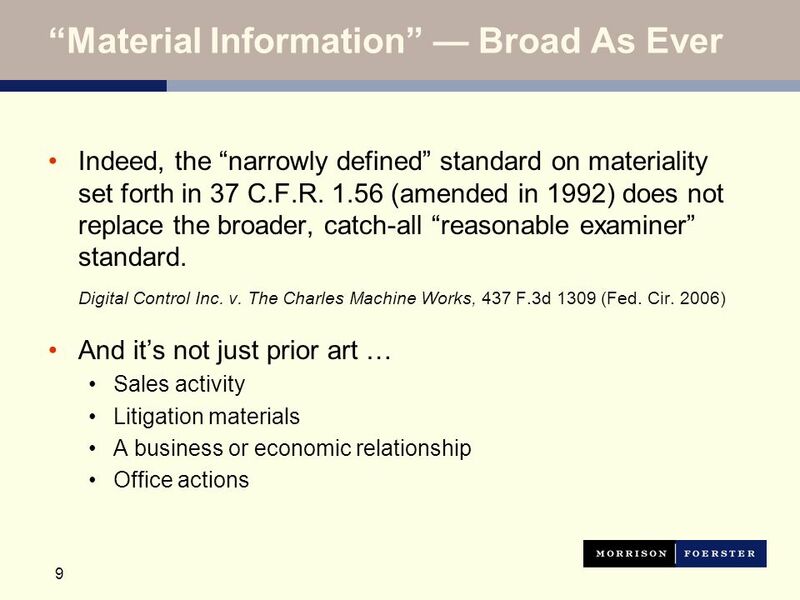 3 3 What is Material Information? The Patent Examiners shoes. 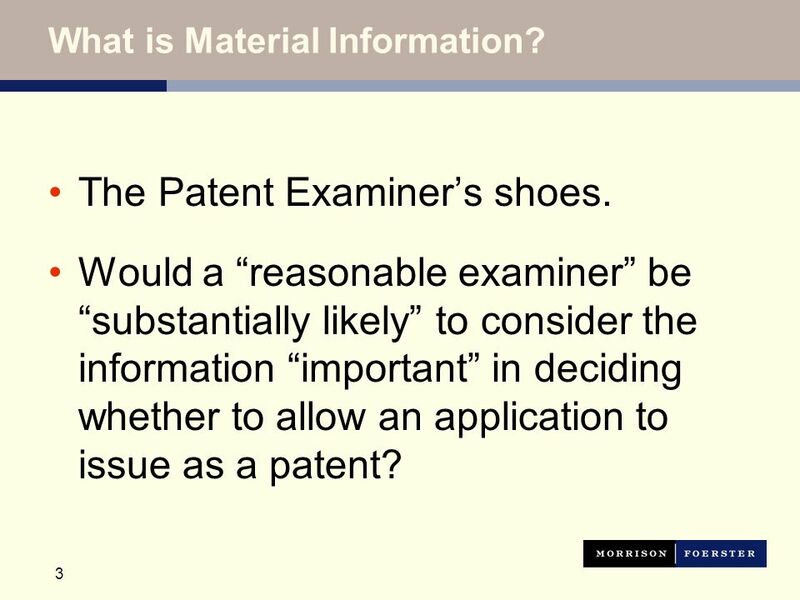 Would a reasonable examiner be substantially likely to consider the information important in deciding whether to allow an application to issue as a patent? 4 4 What Constitutes Deceptive Intent? 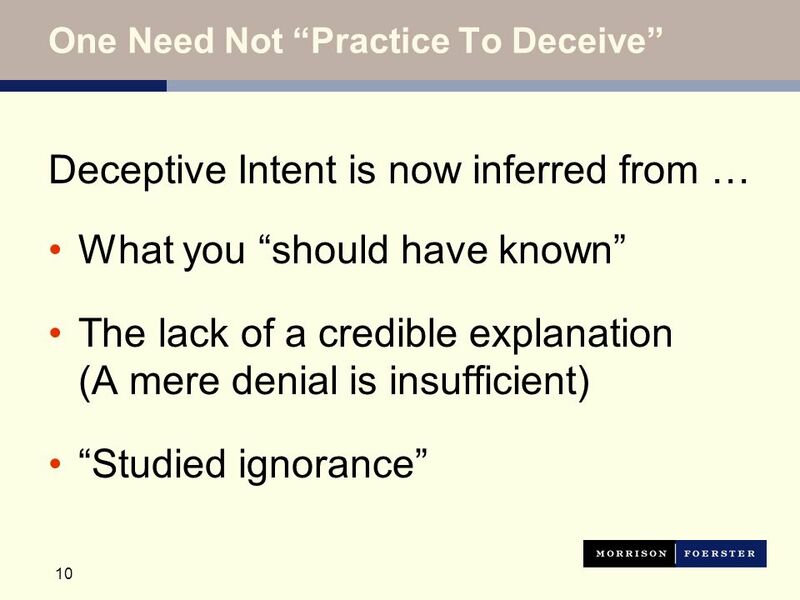 Direct evidence of intent is rare. 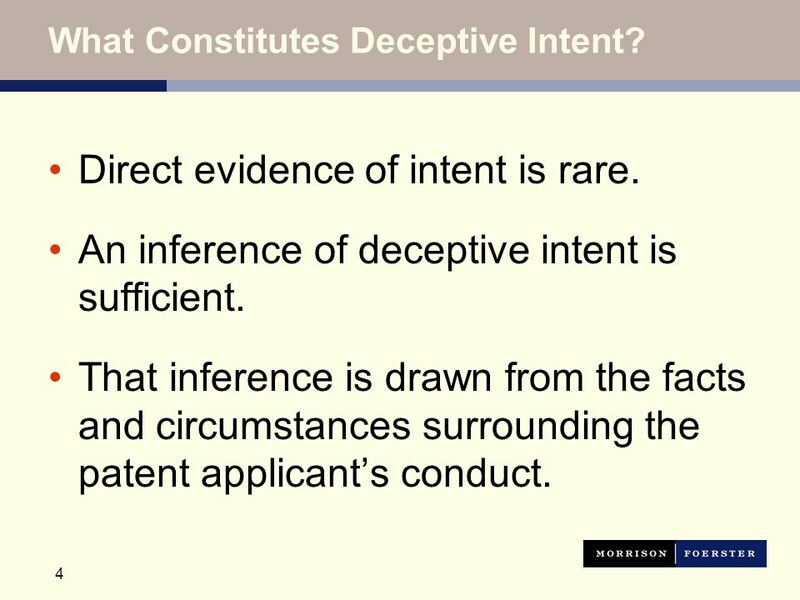 An inference of deceptive intent is sufficient. 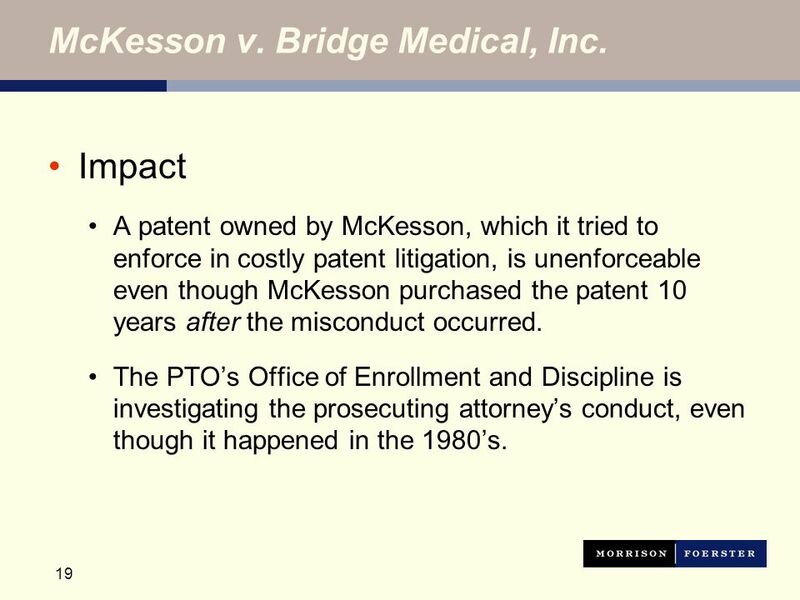 That inference is drawn from the facts and circumstances surrounding the patent applicants conduct. 6 6 Why Should Anyone Care About This Sleepy Defense That Rarely Succeeds? 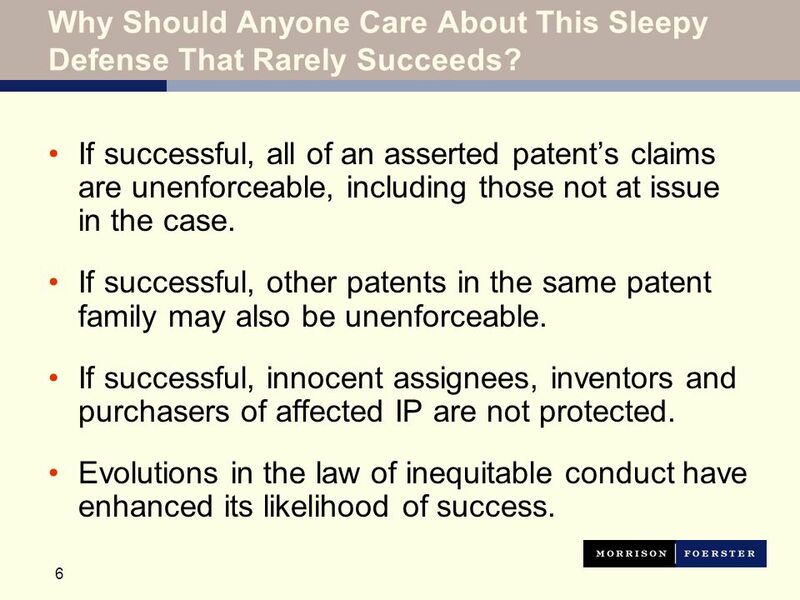 If successful, all of an asserted patents claims are unenforceable, including those not at issue in the case. If successful, other patents in the same patent family may also be unenforceable. If successful, innocent assignees, inventors and purchasers of affected IP are not protected. 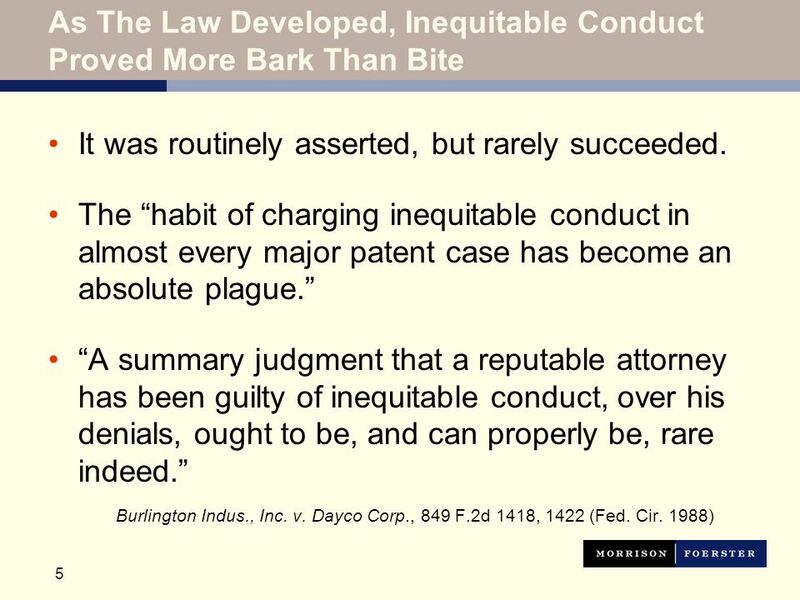 Evolutions in the law of inequitable conduct have enhanced its likelihood of success. 12 12 Now That We Have Your Attention... 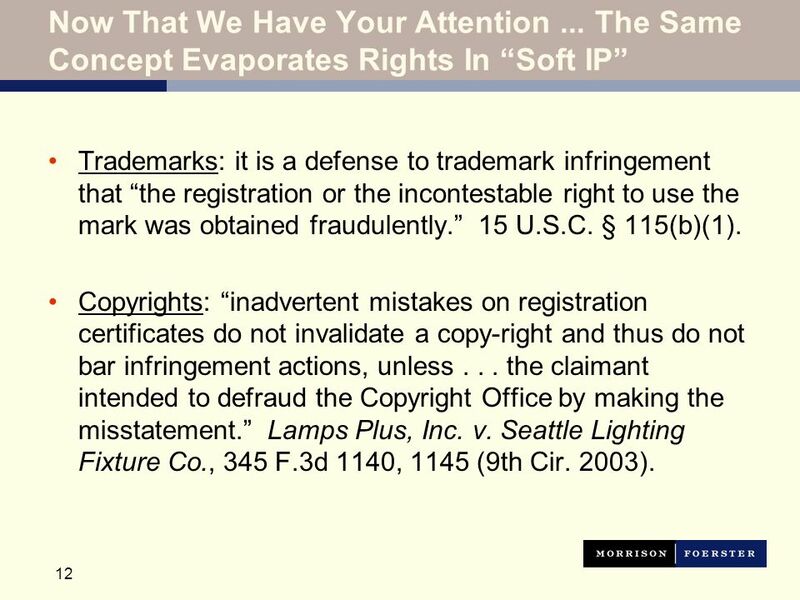 The Same Concept Evaporates Rights In Soft IP Trademarks: it is a defense to trademark infringement that the registration or the incontestable right to use the mark was obtained fraudulently. 15 U.S.C. § 115(b)(1). Copyrights: inadvertent mistakes on registration certificates do not invalidate a copy-right and thus do not bar infringement actions, unless... the claimant intended to defraud the Copyright Office by making the misstatement. Lamps Plus, Inc. v. Seattle Lighting Fixture Co., 345 F.3d 1140, 1145 (9th Cir. 2003). 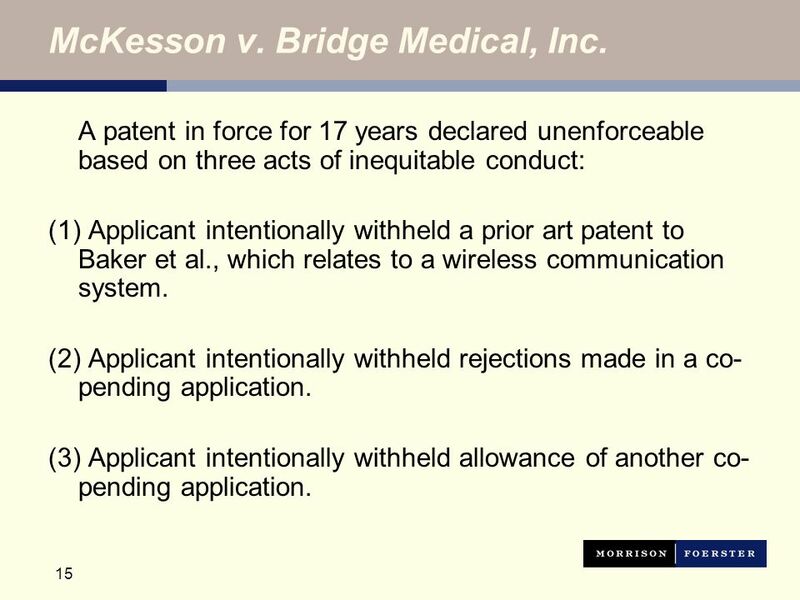 15 15 McKesson v. Bridge Medical, Inc. A patent in force for 17 years declared unenforceable based on three acts of inequitable conduct: (1) Applicant intentionally withheld a prior art patent to Baker et al., which relates to a wireless communication system. (2) Applicant intentionally withheld rejections made in a co- pending application. (3) Applicant intentionally withheld allowance of another co- pending application. 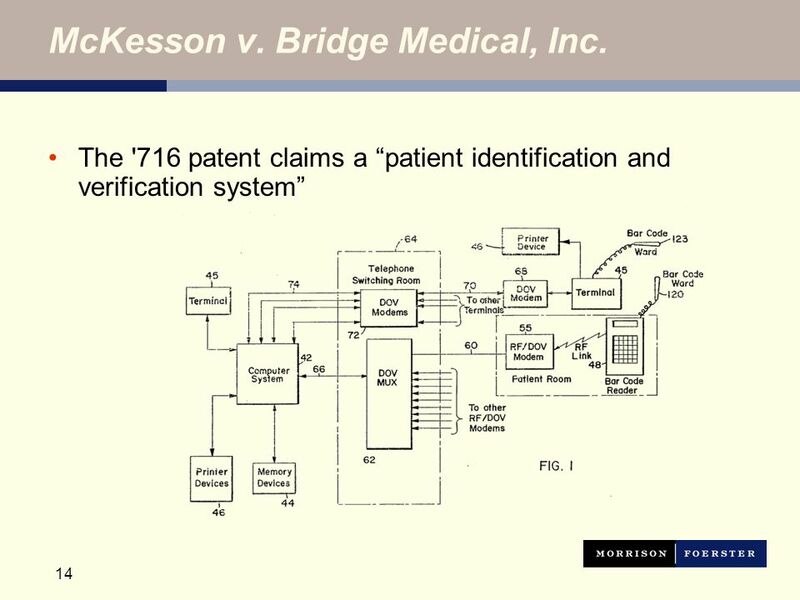 16 16 McKesson v. Bridge Medical, Inc. Finding Baker was material and intentionally withheld The prosecuting attorney could not remember why Baker patent was not disclosed – hindsight not credible. 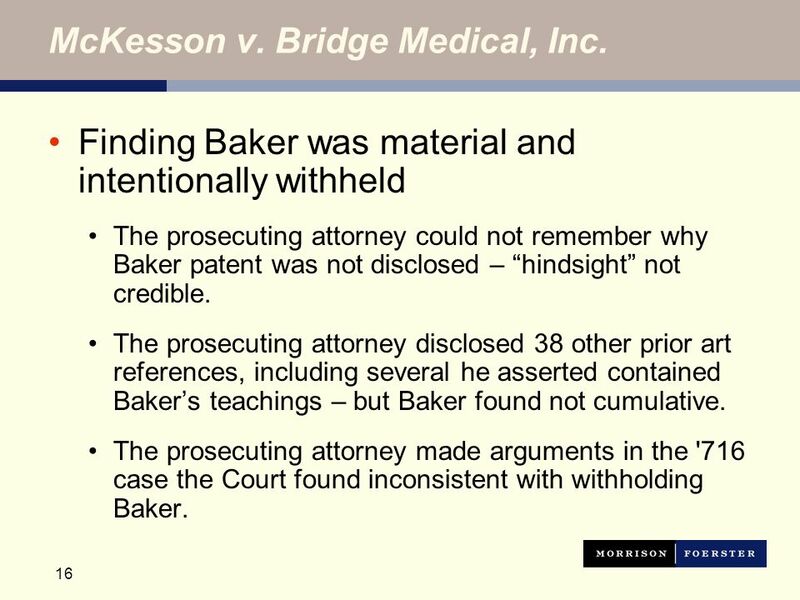 The prosecuting attorney disclosed 38 other prior art references, including several he asserted contained Bakers teachings – but Baker found not cumulative. The prosecuting attorney made arguments in the '716 case the Court found inconsistent with withholding Baker. 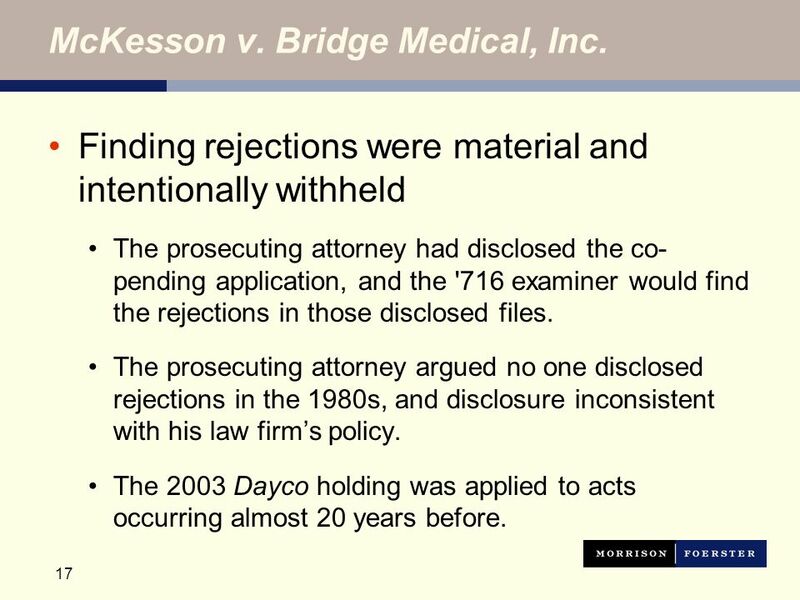 17 17 McKesson v. Bridge Medical, Inc. Finding rejections were material and intentionally withheld The prosecuting attorney had disclosed the co- pending application, and the '716 examiner would find the rejections in those disclosed files. The prosecuting attorney argued no one disclosed rejections in the 1980s, and disclosure inconsistent with his law firms policy. The 2003 Dayco holding was applied to acts occurring almost 20 years before. 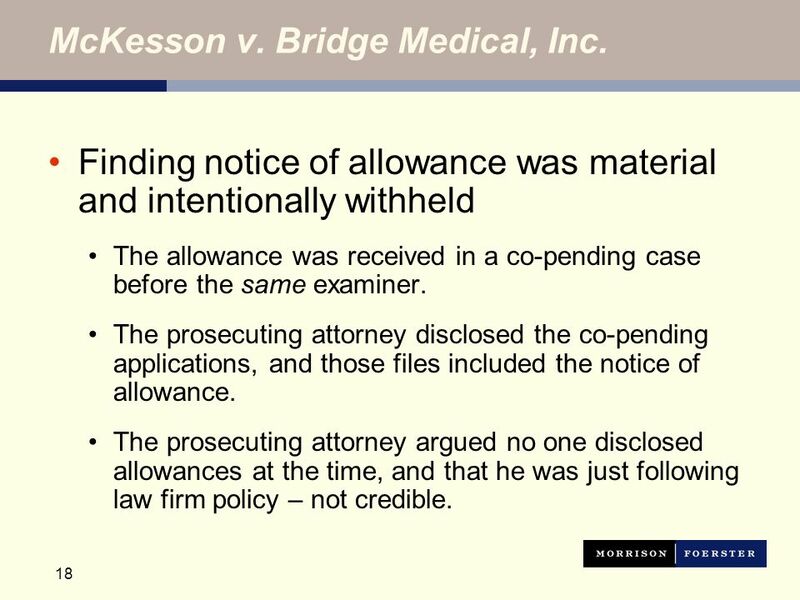 18 18 McKesson v. Bridge Medical, Inc. Finding notice of allowance was material and intentionally withheld The allowance was received in a co-pending case before the same examiner. The prosecuting attorney disclosed the co-pending applications, and those files included the notice of allowance. The prosecuting attorney argued no one disclosed allowances at the time, and that he was just following law firm policy – not credible. 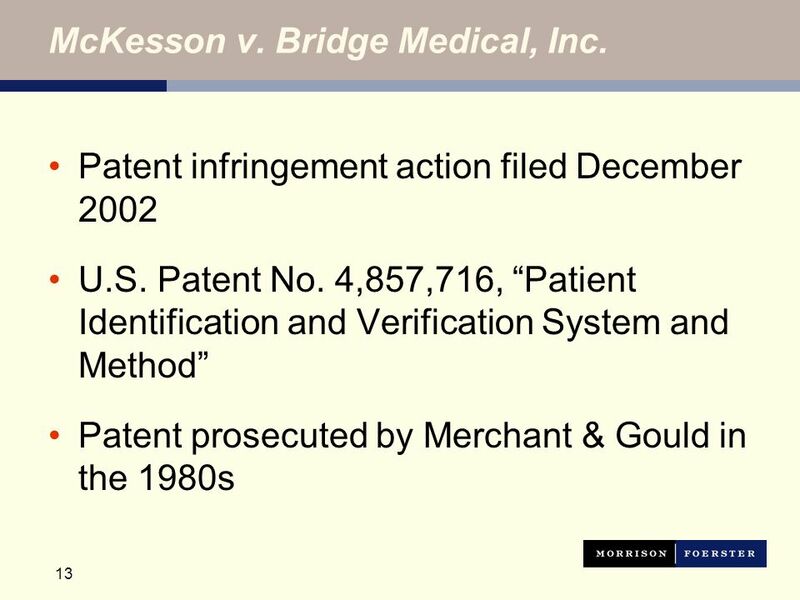 19 19 McKesson v. Bridge Medical, Inc. Impact A patent owned by McKesson, which it tried to enforce in costly patent litigation, is unenforceable even though McKesson purchased the patent 10 years after the misconduct occurred. The PTOs Office of Enrollment and Discipline is investigating the prosecuting attorneys conduct, even though it happened in the 1980s. 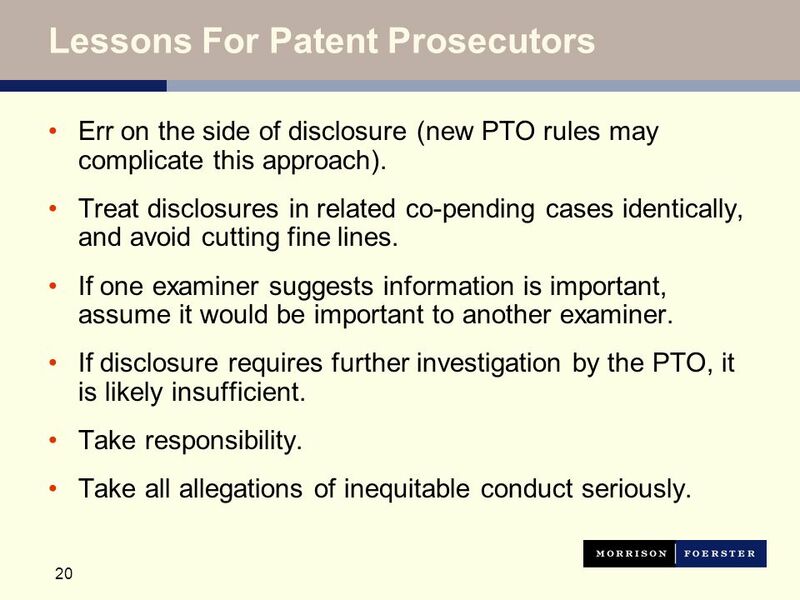 20 20 Lessons For Patent Prosecutors Err on the side of disclosure (new PTO rules may complicate this approach). 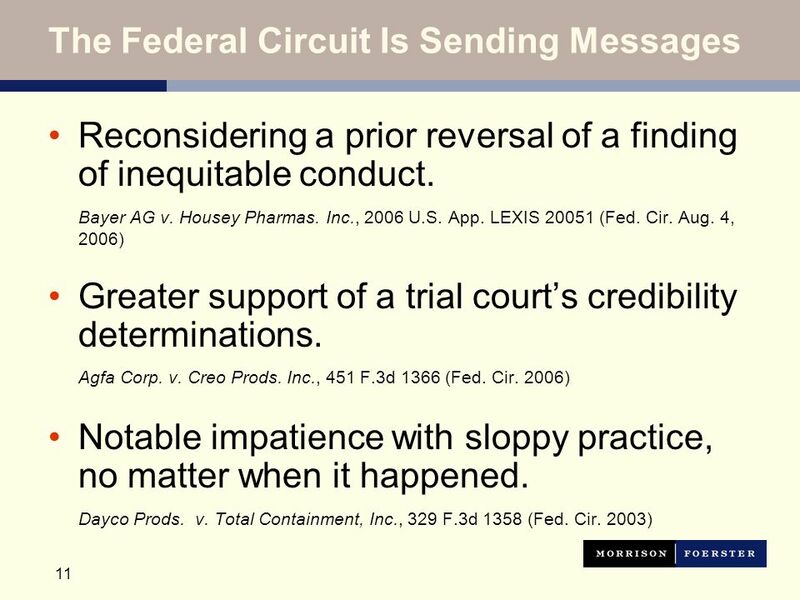 Treat disclosures in related co-pending cases identically, and avoid cutting fine lines. If one examiner suggests information is important, assume it would be important to another examiner. 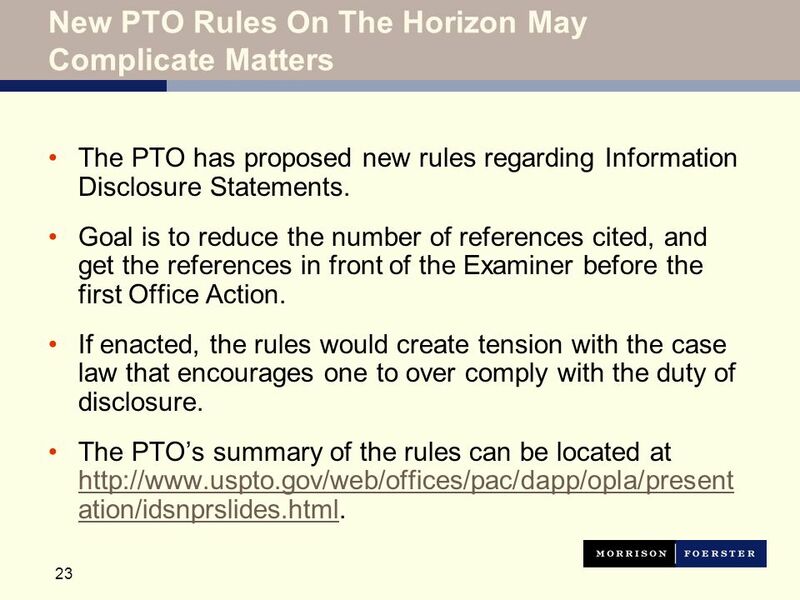 If disclosure requires further investigation by the PTO, it is likely insufficient. Take responsibility. Take all allegations of inequitable conduct seriously. 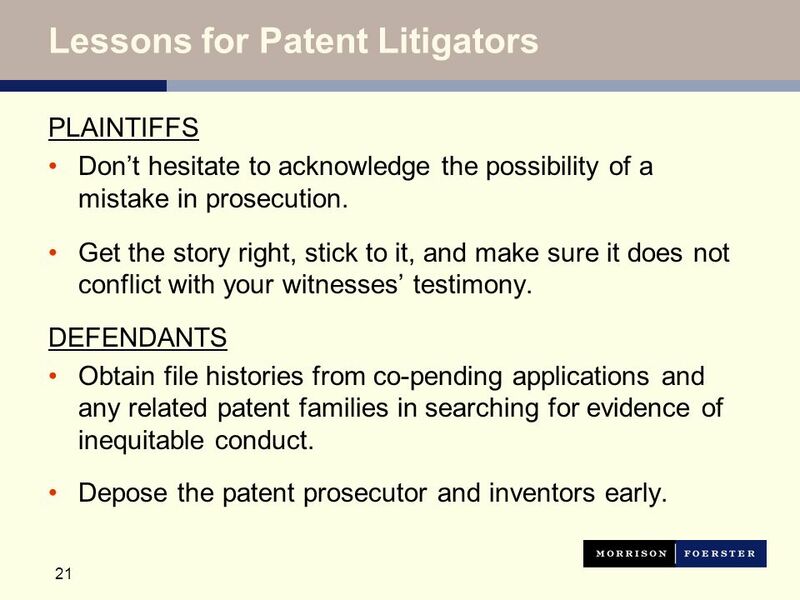 21 21 Lessons for Patent Litigators PLAINTIFFS Dont hesitate to acknowledge the possibility of a mistake in prosecution. Get the story right, stick to it, and make sure it does not conflict with your witnesses testimony. 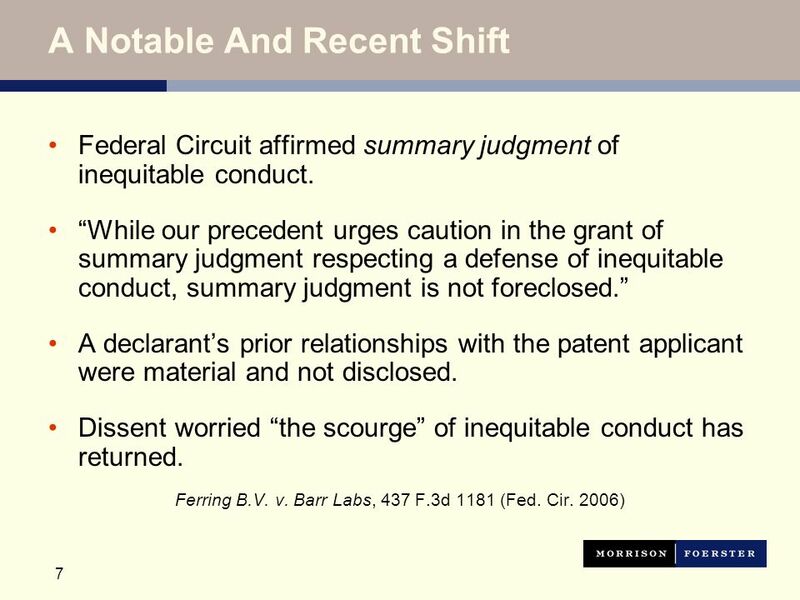 DEFENDANTS Obtain file histories from co-pending applications and any related patent families in searching for evidence of inequitable conduct. Depose the patent prosecutor and inventors early. 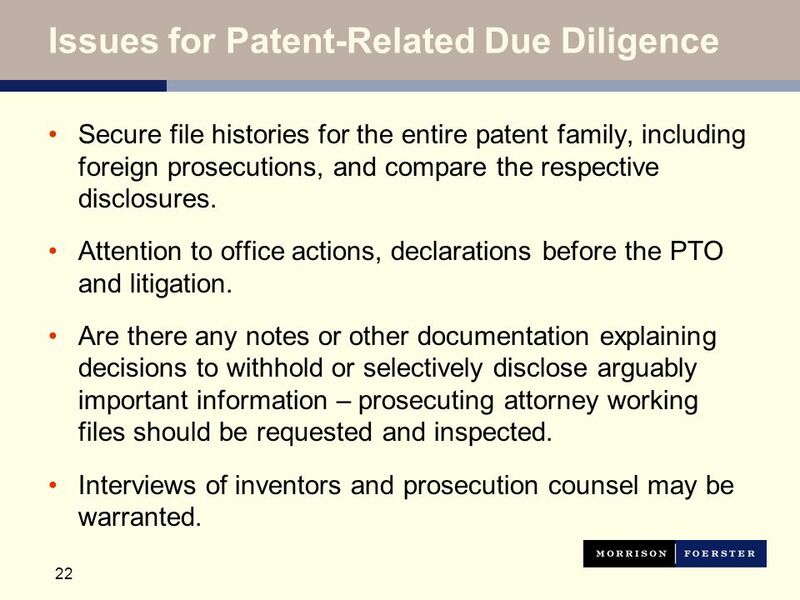 22 22 Issues for Patent-Related Due Diligence Secure file histories for the entire patent family, including foreign prosecutions, and compare the respective disclosures. Attention to office actions, declarations before the PTO and litigation. Are there any notes or other documentation explaining decisions to withhold or selectively disclose arguably important information – prosecuting attorney working files should be requested and inspected. Interviews of inventors and prosecution counsel may be warranted. 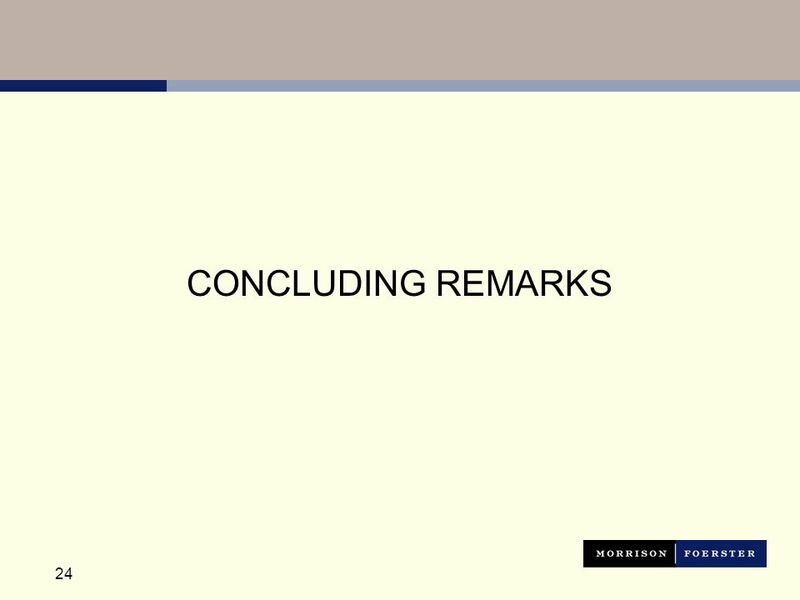 Download ppt "© 2007 Morrison & Foerster LLP All Rights Reserved THE INVIGORATED DEFENSE OF INEQUITABLE CONDUCT: MORE REASONS TO CHECK UP ON WHERE YOUR PATENTS HAVE." Prosecution Lunch Patent January Extended Missing Parts Pilot Program Requirements –A non-provisional meeting filing-date standards and claiming. 1 Class 6 Format of the Thesis, Outlining Outlining Assignment See Assignment. An Overview of the EEOCs GINA Regulations. 2 The GINA Act and Regulations The Genetic Information Nondiscrimination Act (GINA) was signed into law by. 1 Marks Registration In Jordan Presented by: Samer AL-Tarawneh Director Industrial Property Directorate Ministry of Industry & Trade Amman-Jordan. Patents e-Filing Update Biotechnology/Chemical/Pharmaceutical Customer Partnership November 15, 2001. Remy Yucel Director, CRU (571) 272-0700 Central Reexamination Unit and the AIA.